Well, what do you know? I'm not alone in this. 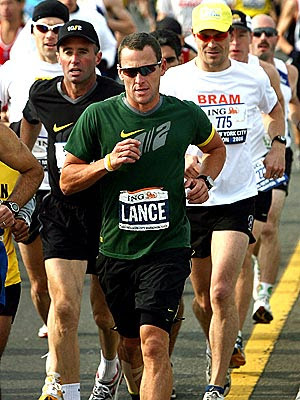 Finishing in 856th place, Lance Armstrong completed his first marathon in 2 hours 59 minutes 36 seconds. Armstrong's build presented a stark contrast to the elite men's runners who preceded him on the course. The cycling champion's heavily muscled legs and powerful chest set him apart from the slender Kenyans who traditionally dominate the race. Even Armstrong compared the leaders' legs to pencils. Armstrong's ex-wife, Kristin Richard, ran the 2004 NYC Marathon, finishing in 3 hours 45 minutes 53 seconds. As a gesture of support, Lance's current squeeze, Ashley Olson, wore a Livestrong™ bracelet as a belt during the race.